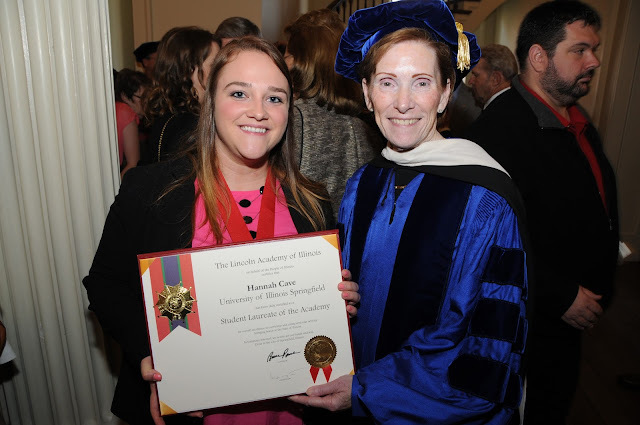 University of Illinois Springfield senior Hannah Cave has been honored with the Student Laureate Award from the Lincoln Academy of Illinois. Cave, a Rochelle, Ill. native, is majoring in Global Studies at UIS with a teaching certification. She holds a 3.85 GPA while balancing a number of campus responsibilities, including being a resident assistant and serving as the student representative to the University of Illinois Board of Trustees during the 2014-15 academic year. Her future plans include seeking a position as a high school social studies teacher, while pursuing a master’s degree, and eventually become a student affairs professional. “I have always loved learning and want to continue doing so,” said Cave, who has made the Dean’s List for the past three and a half years. Because of her love of learning, Cave said she choosing a major was a difficult process. “I have always wanted to be a teacher, but my aspiration for traveling has kept me looking for more, hence my Global Studies major.” While attending UIS, Cave got the chance to study abroad in Finland last summer. “With this plan, I will be able to continue to be a lifelong learner, while helping hundreds of others along the way,” she said. Cave is involved on campus with the Capital Scholars Honors Program and intramural sports and has previously held positions on the Student Government Association. In the community she is a volunteer with Big Brothers Big Sisters, the Red Cross, the American Lung Association and Making the Grade, where she serves as a role model to high school students. “I have had an amazing time at UIS developing my leadership skills and growing as a person and a scholar,” said Cave. “My commitment to UIS is something that will never end as this is where I found my home, honed my skills, met lifelong friends and found myself,” she said.